Parker's Barkers: My Feet are Sore! About a year ago I started having pain on the bottom of my feet in the morning when I first got out of bed. It would go away in a few minutes so I caulked it up to old age, cheap sneakers, those "couple" of extra pounds and maybe too much walking and hiking. It got progressively worse so I did some research and self-diagnosed plantar-fasciitis - a common condition where the tissue on the bottom of the foot becomes inflamed. It's worse in the morning because the tissue tightens overnight. I tried arch inserts and better shoes and that seemed to help - but not enough. I was having real trouble walking in the morning and it was lasting longer into the day. I did not want to give up my hiking and exercising - but that was looking like a real possibility. About 2 weeks ago I visited "Happy Feet" - a shoe store here in Fort Myers - and met with Eric. They sell Swiss-made MBT shoes for people with plantar-fasciitis. The MBT stands for "Masai Barefoot Technology." The sneakers are weird because, as you can see from the picture, the heel of the shoe is curved to the arch and back to the toe which causes you to walk heel first and gives your arch more support. They take some time to get used to but they work! My friend Mel tells me they are similar to "Earth Shoes" from the hippy-era (which I apparently missed) and make you walk as if you are barefoot on a sandy beach. 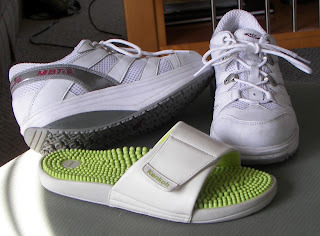 The other shoe in the picture - the green and white sandal - is to wear when I first get out of bed or go to the pool. At first those little green nubs hurt like heck on the bottom of my feet - but I kept with it and now they feel great. I'm wearing them now. I still have some soreness - but nothing like before. Now the really bad news. These shoes are expensive!! The sneakers were $250 and the sandals were almost $70. Outrageous. But Bill said it's cheap if it works - and I think the price made me stick with them.